One big aspect everybody faces an issue at some point in time while using a smartphone is about the memory space on it. There have been big improvements in the storage capacity of smartphones during all these years. When the use of smartphones increased and the number of activities too increased, and the amount of data being saved have climbed up to a peak. This is where SD card became an integral part of the smartphone, and in the previous years, the capacity of SD cards also increased. Now, most users save a lot of important data on their SD cards. So waking up to a notification on your phone saying SD card not recognized or broken can be the worst nightmare you have had recently. 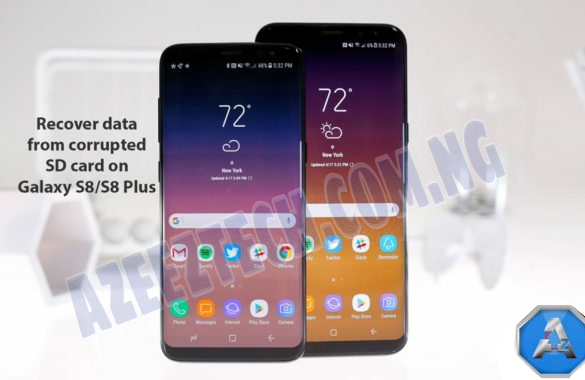 We can help you by guiding you through steps to recover data from corrupted SD card on Galaxy S8/S8 Plus. There can be many reasons for your card getting corrupted out of nowhere. Although it is just a small chip and anything can happen to it at any time. As it is too small repairing it like other memory drives is impossible, and this makes things worse. But there is no need to freak out about this, as there is still a probability of getting the data back to you. everything you can follow in order to get the data saved on a corrupted SD card is listed below, please read through. Although looks so basic, in many cases this single step have solved everything. You don't have to freak out and waste a lot of your time doing other steps, you can simply try this and at many times it does work. Before doing anything with your device, you should make sure the real problem is with your card itself. Sometimes a corrupted SD card notification can come because of the device card slot issues. So try it with other device and if it is working, get some technical assistance and repair your device card slot. You can also get third-party apps which can help you recover data from your card. There are a lot of such apps available for free, which can even recover deleted files. I hope this guide was useful in understanding how to Recover data from corrupted SD card on Galaxy S8/S8 Plus. If you have any queries or feedback, please leave a comment below.